At the worst of the snow, a third of Orly's flights were canceled on one day. 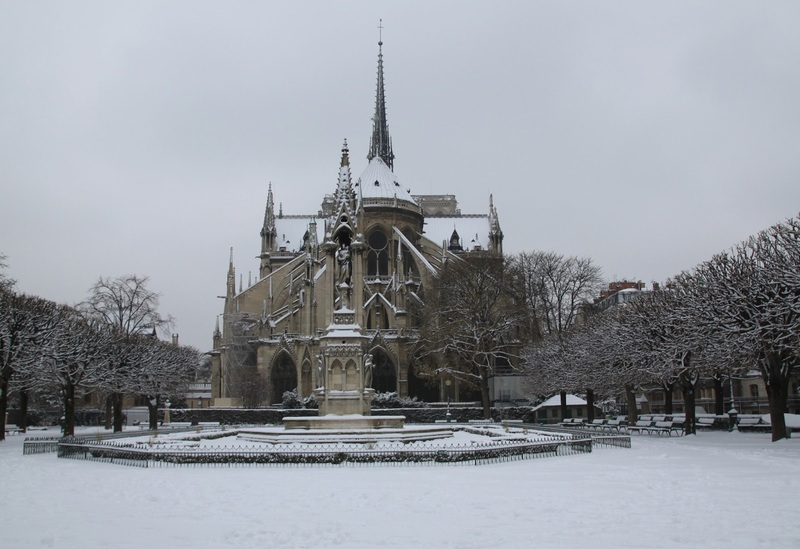 There were repeated warnings of black ice for Paris because of the danger of overnight freezes. A third of the entire country was on orange alert because of weather. Because the French-language news reported it so heavily, even the French Canadians heard about it. Their response is really the only appropriate one from people living in Quebec, and that is scornful, uncontrollable, mocking laughter. There's a video you can watch of some Quebecois watching French coverage of the snow. They just cannot contain their giggling at how the French consider 3cm -- to them a "dusting" of snow -- a blizzard worth mentioning. For heaven's sake, you can still see the pavement on the roads and the tracks of the train. The Canadians are so entertained, it's entertaining. Also rather entertaining: somebody has made a map of the slopes....in Paris. Those of you who know the city well will wonder, as I do, why the "Pantheon" black slope is on the Right Bank, rather than next to the green "Jardin du Luxembourg" bunny slope, as it should be. The ultimate slope in Paris is straight down from Sacre Coeur. Sacre bleu! 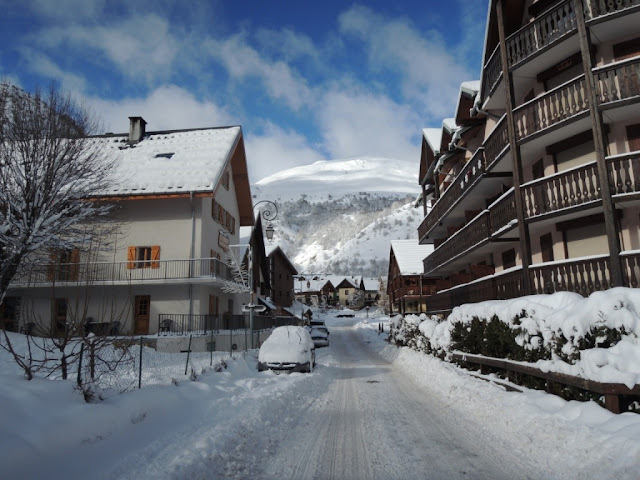 Just a few days later, the snow is just about back to normal now -- in France, that is. In Tahoe, I am told it's still dry as a bone. But since it snows so rarely (or, more precisely, snows and accumulates and sticks so rarely) in Paris, it's always a good excuse to share photos with you of Paris looking even more like a black and white photo than usual, which is really saying something. You've heard of Chamonix and Val d'Isere, but here we have Valloires, which is #223 on the list (in alphabetical order) out of 231 resorts. 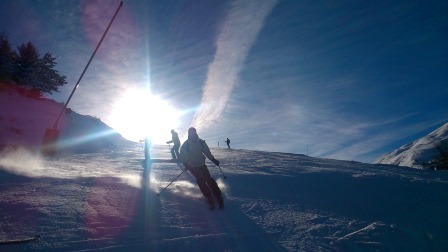 Many of these lesser-known spots are great deals for gorgeous Alpine skiing, often with lodging, food, and lift-ticket all included for approximately 100-150€ per day. Compare that to Tahoe, where just the lift-ticket alone is $150. It's actually quite a bargain (and kids' ski camps even more so: 100-150€ per day, including transport from and to Paris, all lodging, food, rentals, lifts, lessons, full supervision, and camp activities). Here we have les Karellis. You've likely never heard of this station, but Anthony can vouch for it. 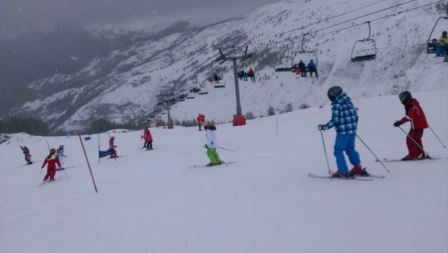 Just another one of hundreds of places in France with beautiful views, fantastic slopes, and....snow. Flocon de Savoie means, literally "Snowflake of Savoie" which already gives you a big hint that it's a mountain cheese. Savoie is right on the Italy border, in the Alps, a place that produces, in general, great mountain cow cheeses, usually hard and crumbly. This one is a different kind of mountain cow cheese though: much more delicate, soft, and creamy. And I'm not complaining. 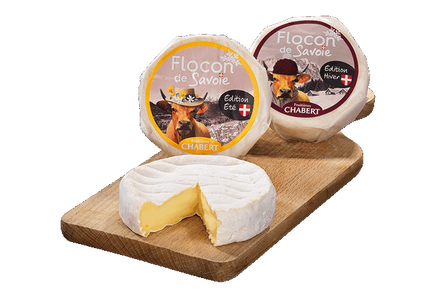 Flocon de Savoie is made of pasteurized cows' milk on a family farm, Fruitières Chabert, run for several generations (since 1936) by the Chabert family. 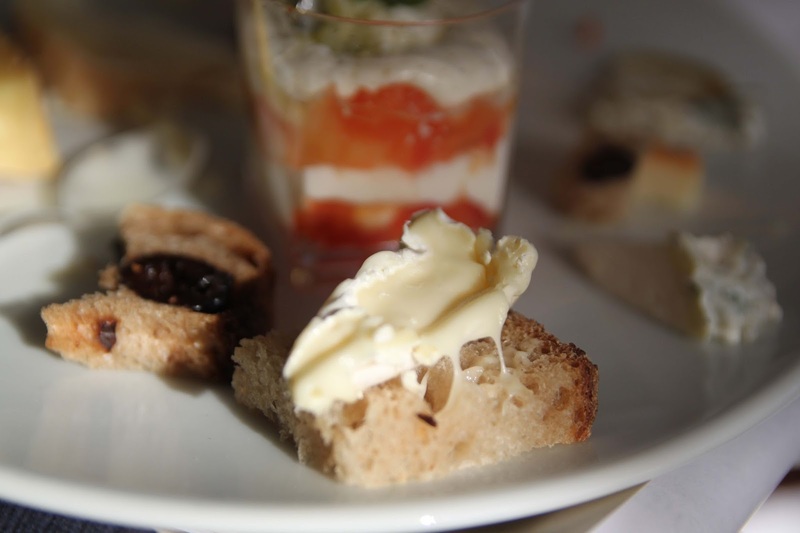 The farm does produce many of the classic hard mountain cheeses: Abondance, Beaufort, and Tome des Bauges, all AOP. Also Emmental de Savoie, Gruyère, Raclette de Savoie, and Tomme de Savoie, all IGP. The other soft cheese made by Fruitières Chabert is their Reblochon AOP. The Flocon de Savoie is a little milder than the Reblochon, but still full-flavored and delicious. It comes in both organic or non-organic, and is a buttery, rich, melty treat with hints of sweet grass. It develops a delicate crust through its aging process, during which it is turned by hand ever other day. The fact that it is pasteurized makes it more easily transportable and, especially, exportable, which is one of the business aims of the younger Chaberts currently in charge. They produce and sell a summer edition as well. Because the milk is pasteurized, I couldn't really tell the difference by taste, but I could tell the difference by the packaging. I like a cheesemaker with a sense of humor (and a cow with a sense of fashion). If you're lucky, you'll find this "snowflake" -- with its funny hat-wearing cows on the label -- even if you're in a place with no snow. No matter which side of the Alps you're skiing, at least this year you've got great snow, much like there was, for a brief shining moment, on the slopes of Paris. These pictures, and a story about snow and skiing, just had to be accompanied by Flocon de Savoie -- a "snowflake" by name.